Order your own copy of The Fires Within at your local retailer or online through our website today! Illuminating Rokugan, Fire is an element of passion, love, and obsession. In moderation, this element is vital to the Emerald Empire, inspiring creativity and ingenuity across the land. However, when stretched beyond its boundaries, Fire can turn into a raging inferno, destroying all in its path. It is a difficult balance to maintain, and the scales are beginning to tip. The Fires Within explores the explosive element of Fire with new Spells and Shugenja focusing on the element, as well as a new card for the Mantis and a new ancient Creature to aid the Unicorn. 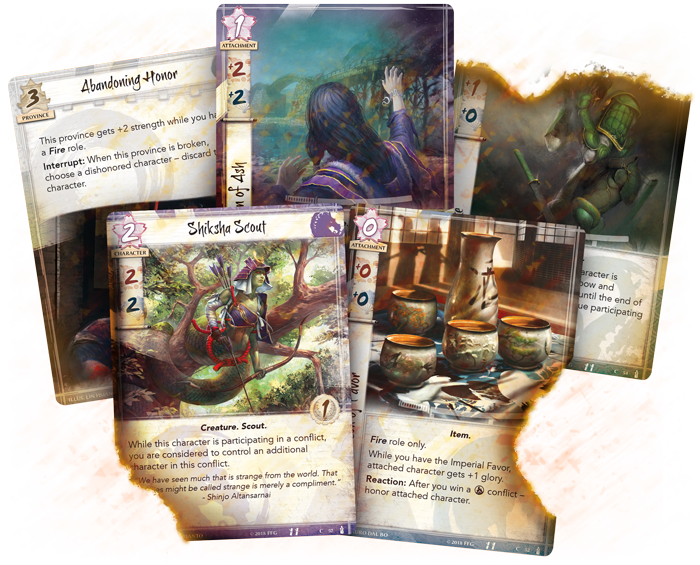 Join us today as we preview The Fires Within, the third Dynasty Pack in the Elemental Cycle for Legend of the Five Rings: The Card Game! 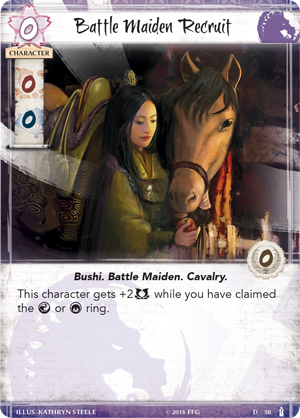 While the Unicorn are known for their fearsome cavalry, their battle maidens, and their meishōdō wielders, they sometimes must rely on other, stranger allies—ancient creatures who have long called Rokugan their home. As the Elements fall out of balance, these elder beings take up arms to assist the Great Clan. The Shiksha Scout (The Fires Within, 57) enters the game as a conflict character who aids the Unicorn Clan in their time of need. 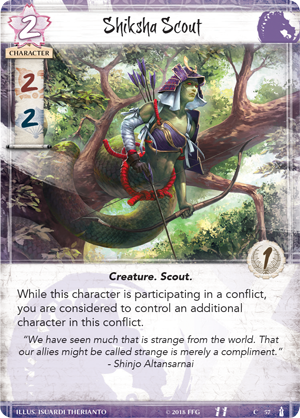 This strange Creature may be unlike anything a samurai has ever seen in Rokugan before, and it offers a similarly unnatural effect: while the Shiksha Scout is participating in a conflict, you are considered to control an additional character in the conflict. 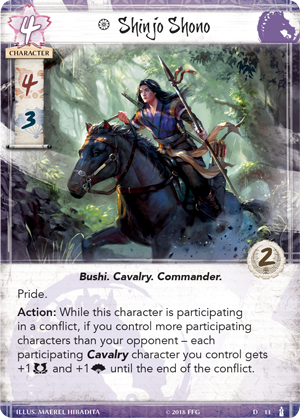 While this may appear to do very little on its own, the Unicorn receive new support in the Elemental Cycle that encourages them to control more participating characters than their opponent. For example, the Shiksha Scout can be used to activate the ability of Shinjo Shono (Breath of the Kami, 11), boosting your number of characters and raising the political and military skill of your Cavalry. While you may be outnumbered at the start of a conflict, Shiksha Scout can easily even the odds and provide a surprise boost to your forces. Even if you don’t outnumber your opponent, a balance of military and political skill makes the Shiksha Scout a flexible warrior who can slot into any conflict. The Unicorn have other ways to increase their numbers as well. As an inexperienced warrior, Battle Maiden Recruit (The Fires Within, 50) has zero military skill and zero political skill, but she can also be placed on the field for free. While the Battle Maiden Recruit is untested, she is still a Cavalry character, meaning she can be boosted by effects like Shinjo Shono’s. Furthermore, she can grow on her own as she learns. If you have claimed the Water or Void Ring, the Battle Maiden Recruit gains two military skill, allowing her to hold her own in military conflicts. This conditional skill boost, along with her traits and ability to help you outnumber your foe makes the Battle Maiden Recruit a great investment for zero fate. Creativity and individuality is the domain of the Dragon Clan, and they often harness the element of Fire to disorient their foes and gain unique advantages in their conflicts with the other Great Clans. Smoke (The Fires Within, 54) is a one-cost attachment Spell that raises the military skill on one of your characters. 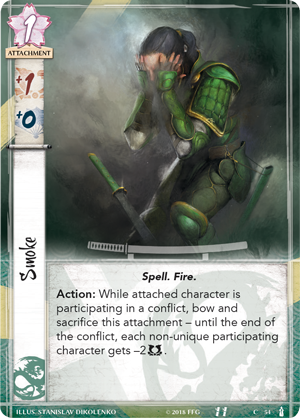 Furthermore, while the attached character is participating in a conflict, you may bow and sacrifice Smoke to reduce the military skill of each non-unique participating character until the end of the conflict! Smoke is a powerful tool, but it doesn't discriminate in its targets, and even your own characters will be affected by the skill reduction if they are not unique. Obviously, Smoke works best when you have built up a named character like Agasha Sumiko (The Chrysanthemum Throne, 65) with a variety of attachments. That way, Smoke simply hits your opponent’s characters, greatly impacting their skill value, and potentially allowing you to break a province with a single character. Smoke is also a great defensive tool—the more characters your opponent sends at you in a conflict, the more effective Smoke becomes, and it may singlehandedly save you from losing a province. 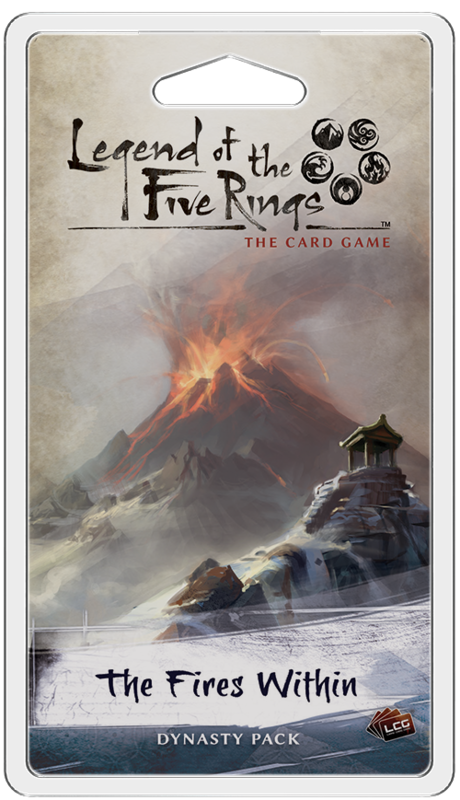 A second Dragon card in The Fires Within can also help you defend your lands. 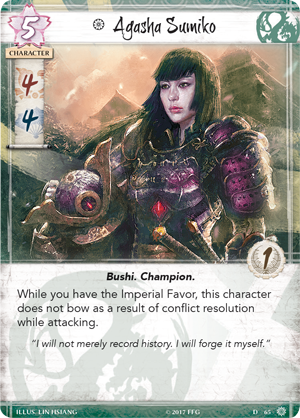 The Wrath of the Kami (The Fires Within, 45) is a holding that's limited to one per deck, and as an Action during a conflict at that province, you may lose one honor to boost the province's strength until the end of the turn. The kicker is this ability is unlimited! This means that if you're willing to lose your honor, you can ensure this province is nearly unbreakable. As with all things, this must remain in balance. Playing too far into The Wrath of the Kami can lead the Dragon to the brink of disaster if you're not cautious. 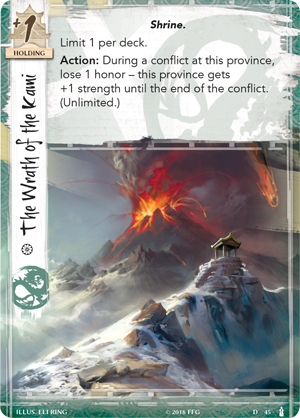 With Smoke and The Wrath of the Kami, the Dragon receive several new tricks in The Fires Within that make their provinces difficult to take down—giving them the opportunity to strike at their foes in a balanced and focused manner. The Elements are out of balance. Fire can provide: it can be warm, it can stoke creativity. But when a lingering passion turns into a blazing inferno, will Rokugan be safe? And who will rise to protect it? Find your fire with The Fires Within (L5C11) available now for pre-order from your local retailer or our website!